If you remember one of our early solar posts when building the house, we initially assumed that solar was going to be too expensive for us. Then we ran the numbers and found that the rate of return was actually quite attractive over the log run. Same goes for our new plug-in hybrid. We had been a one car family since Jill and I met. Our four-wheel drive Ford Escape was both our commuter car and utility vehicle. We made multiple moves in that car. We carted goats and chickens and guineas in that car. We transported a year’s worth of hay. We hoped the Escape would carry us a few more years, but at over 200,000 miles our trusty steed was starting to cost us more in gas and repairs than buying a new car. We now have a truck to haul goats and other farm trappings when needed, so Jill started researching commute-friendly cars. She drove three hybrids, Honda Insight, Toyota Prius and Ford C-Max. The C-Max had the nicest interior and was more similar feeling to the Escape, but was the most expensive and the mpg reviews were mixed. The Insight had a great price point, but had the worst mpg estimate and interior feel. So we focused on the middle-priced Prius which had the best mpg estimates and a good track record. With our current net metering plan, it’s better for us to use the excess than sell it back to the utility which pays us very little. It initially looked like a plug-in hybrid was out of our price range (even with federal credits) but when I added up the miles: 19,500, the gas: 970 gallons, and gas dollars: about $3,600 a year, I realized the extra savings in gas might justify the higher cost. The Escape was averaging about 20 mpg. The regular Hybrid Prius averages 50 mpg and would save us 580 gallons of gas and $2,150 per year. Toyota says the Prius plug-in gets roughly 95 mpge (that’s miles per gallon plus electric). We test drove the plug-in for a few days on back country roads and found it was closer to 85 mpge. The plug-in component gives you an extra 13-14 miles before the hybrid engine kicks in. We estimated conservatively that 70 mpge would save us 690 gallons and $2,560 per year, but use approximately 1,400 kWh per year. That would cost us about $210 in electricity charges if we were paying for electricity, which means we would only be saving $2,350 per year in gas. The regular Prius is $24,995. Toyota had a special offering interest free loans up to 60 months. So $25k/5 = $5,000/year plus $1,450 in gas equals $6,450/year. Now remember, we were paying about $3,600/year for gas, and $2,000 or more per year in maintenance. So we’d be paying an extra $830/year for a new car. The plug-in version is $8k more. $33k/5 = $6,600/year. But in addition to 0% interest for 60 months, they were also throwing in a $4,000 rebate for plug-ins. There’s also a $2,500 federal tax credit. That brings the price down to $26,500, only $1,500 more than the regular Prius. That works out to $5,300/year plus $1,030 in gas, plus $210 in electricity equals $6,540. That’s about $90 extra per year for the plug-in, assuming we paid for electricity. Take out the electricity (because we produce excess electricity per year) and the plug-in is cheaper than the regular Prius. Of course we didn’t start at the $33k price, Jill bargained them down. 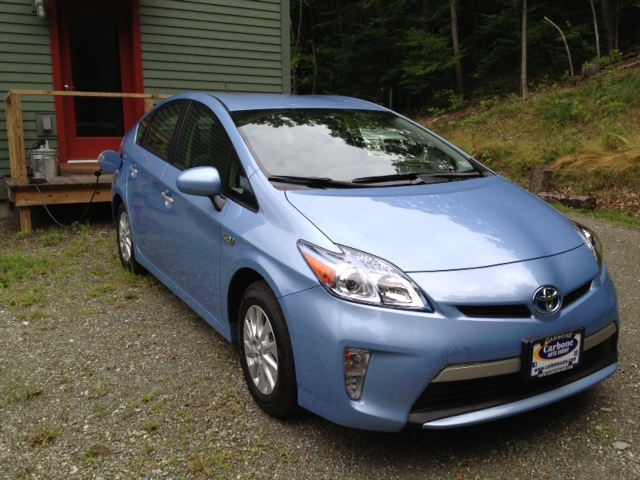 After rebates and tax credits we’re paying about $100 less a year for the plug-in over the regular Prius. So we are basically paying about $520 more per year (not counting electricity, and assuming gas prices stay the same) for a new car that is easier on the environment. If we get closer to 85 mpge then we will only be paying $330 extra per year. If/when the price of gas goes up, we save more. The only down side. The Prius is definitely not going to make it up our driveway some days in the winter. It’s official, we earned our 5+ Energy Star rating. But the result was not what we expected. Our contractor used our house as an opportunity to apply for status as an Energy Star builder. It worked. He’s now an Energy Star approved builder, and we have a 5+ star Energy Star home. In the process we discovered a big difference in the projected energy usage by our Energy Star certified rater using REM/Rate and our certified PassivHaus consultants who used the PassivHaus spreadsheet. First a bit of background. At the beginning of this project we briefly considered certifying the house under one or more of the prevailing certification programs, PassivHaus, The Thousand Home Challenge (THC), LEED and Energy Star. (At the time there was no Net Zero certification.) In the end we decided it was not really worth the cost or effort for PassivHaus or LEED. Most of these certifications have little to offer the homeowner besides bragging rights. We felt that a verifiable record of the performance of the house over time would be enough bragging rights for us. (We’re still considering trying for the THC, but the spreadsheet leaves us a bit bewildered). We did hire a certified PassivHaus energy consultant (DEAP Energy Group) to run the numbers on our proposed design to estimate our required heating loads, energy usage and required PV array to get to net zero. After all our research, I felt the PassivHaus spreadsheet offered the most accurate projection of energy usage and the associated training for certification promised that there was some intelligence applied to using the spreadsheet. We were very happy with the analysis and feel confident that the results will be confirmed after our first year in operation. We’ve purchased energy and temperature monitors to provide some data for analysis at the end of the year. Although we had opted out of the certification programs, our contractor, Warren, decided that this project was an excellent opportunity to apply for status as an Energy Star builder, which would grant the house an Energy Star rating if it met all the conditions. (For a house to be certified as an Energy Star home, it has to be built by an Energy Star certified builder. The general process is described on the Energy Star site, How New Homes Earn the Energy Star.) Energy Star represents the lowest hurdle out of the other certification programs, but is also the most widely used. There are several versions of certification available, from 2.0 (now unavailable in 2012) to 2.5 and 3.0. Each version is more stringent than the previous. These versions are timed to replace the prior versions over time. After reading through the high-level requirements, we thought we’d be able to easily qualify under the 3.0 version. However, because we were already many months into the build before we engaged the energy star certified rater, Newport Ventures, we missed the opportunity to be certified under the newer 2.5 or 3.0 standard. Our choice of HVAC contractor also contributed to this problem, as they were not certified under Energy Star requirements. If we had done our homework earlier, we might have been able to certify under one of the higher standards. So although the house is more efficient and built to more stringent standards than even the 3.0 version, we were only able to qualify under the 2.0 version. One of the steps in the Energy Start certification process is to rate the efficiency of the house. The result is a HERS (Home Energy Rating System) index value. It is an index value (percentage) because it compares the efficiency of a specific house (ours in this case) with a reference model home that is based on the 2006 International Energy Conservation Code (new house efficiency / model house efficiency = HERS index). The lower the value the better the efficiency. For an excellent review of HERS, see Martin Holladay’s article on GreenBuildingAdvisor, How Is a Home’s HERS Index Calculated? He also describes the various pros and cons of using HERS. To qualify as an Energy Star home, the house must earn a HERS index value of 85 or better. The lower the value the more efficient the home. Warren got the final report (Home Energy Rating Certificate) a few days ago. Our HERS index, as rated by Newport Ventures, is 22 which equates to a 5 1/2 star Energy Star rating. We should have been happy, right? We were, except for one thing, we were expecting it to be zero or negative. One of the hallmarks of HERS is that a Net Zero house should get a zero index value or lower. Unfortunately the certificate itself is quite vague. It doesn’t make it clear whether the power generation capability was included in the score or not, although it appears to be included. It projects our heat load to be half what the PassivHaus spreadsheet indicated (6.9 vs 12.4 MBTU/yr.) and it projects our lighting and appliance load to be much higher. HERS projects our total energy usage to be 42.4 MBTU/yr., DEAP projected 20.4 MBTU/yr. The HERS heating estimate alone makes me suspicious. We’re going to try to get a bit more clarification from Newport Ventures in the coming weeks. We didn’t expect the numbers to match up exactly, but we did expect them to be in the same ballpark. We will report back when we learn more. I was reading The Right Target, a post on Marc Rosenbaum’s blog a few weeks ago and realized that we too might be able to qualify for the Thousand Home Challenge. The goal of the Thousand Home Challenge is to reduce the energy usage of 1,000 homes by 70 to 90%. It outlines two paths to meet the challenge. Option A is a specific reduction from current usage. We’re going to ignore that since we’re building a new house. The target is based on a combination of climate, size, number of occupants, heat source and whether it is attached or detached. They have a handy spreadsheet you can download at the thousand home challenge website. Just punch in your numbers and it will tell you your target. Here’s the run down on our inputs. Climate – The closest weather station data was determined to be North Adams, Massachusetts, but I chose Glen Falls, New York, since this is what we used in the original energy calculations. The home’s finished floor area is 1,200 sf. Two occupants, not counting critters. Based on that scant information, the threshold calculator produced a target value of 5,619 kWh/year (site energy) if using electricity for heating. This works out to roughly 19.2 million BTUs/year. If you remember back to our earlier energy posts, our energy consultants estimated our yearly energy use at 5,995 kWh/year, or 20.4 million BTUs/year. So if we ignore the solar PV array, we would be roughly 376 kWh short of meeting the Thousand Home Challenge. I like a challenge, so I’ve signed us up for more information and to start the application process. I’ll post more info as we progress through the process. To get to net zero energy use, we must produce enough energy to offset our energy usage over a year. We originally planned to live in the house a few years before installing photovoltaic (PV) panels on the roof, but after we ran the numbers we decided it made sense to do it now rather than wait. First a little context. How much energy should we be trying to offset? Our energy consultants estimated our total site energy usage at 5,995 kW hours per year (kWh/y). Based on this, they recommended a 6 kW array which they estimated would produce roughly 6,000 kWh/y. At $0.14 kWh that’s roughly $840 per year total energy costs (not counting the Basic Service Charge of $16.21/month and misc. charges). That includes heating, cooling, hot water, well pump and plug load (it’s an all electric house). It is important to note that we’re using site energy numbers rather than source. Source energy is the energy that the power company must generate in order to supply power to the site. Roughly 2/3 of this power is lost on it’s way to the site. 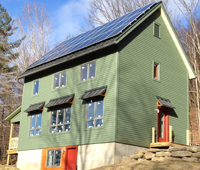 Some net zero homes try to offset their usage based on source energy rather than site energy. Our estimated source energy usage is approximately 16,187 kWh/y. This would require a much larger array, more space and, of course, a much bigger wallet! We have approximately 646 sf of south facing roof area.This is enough room for roughly 30 panels, 3 rows of 10. One of the most popular panels being used right now is a 230 watt panel. 30 panels x 230 watts = 6,900 watts or 6.9 kW. This is DC power. Factoring in some losses converting DC to AC, and the solar potential for our geographic location, this equals roughly 7,000 to 8,000 kWh/y AC. I originally estimated the system would cost in the range of $20k just for the panels and inverter, not counting all the other wiring, roof clips and rails, inspections and labor. I figured design and installation costs could double that number. I knew there were state and federal tax credits but I was surprised to find out how much federal stimulus dollars are available. In New York, NYSERDA administers this money, and rebates roughly a third of the cost of a solar PV system (including labor). I pay taxes, so it’s nice to get a little something extra back. Th rebate brought the total cost of ownership down to a level that made sense to go forward with the installation now rather than wait. I called a few solar installers and settled on GroSolar. (GroSolar recently sold the residential part of their business to SolarCity.) Once the rebate and tax credits are figured in, the entire 6.9 kW system is less than $15k. Assuming we just count the $840 calculated above as saving per year, then the system would pay for itself in roughly 18 years, assuming electricity stays at $0.14 kWh. We are scheduled to get our system installed in April. I’ll post again when I have more details on all the components of the system. There are several ways to approximate the cost of a leaky house. Before I proceed, however, I just want to mention there are other much larger longterm monetary benefits to building a tight house, like a longer lifecycle and less maintenance due to keeping critters and moisture out of the building enclosure. I’m sure there’s a way to calculate the value of these additional benefits, but it’s beyond my abilities (and you’d have to use a lot of assumptions to get there). Having gone through the numbers, there is some value to understanding the factors that are used to estimate the cost of infiltration, as well as the proportion of infiltration cost to the overall energy costs required to heat a house. The primary method to estimate infiltration is to calculate the energy required to condition the air replaced by infiltrated air. First we must convert the ACH50 value derived from the blower door test to a ‘natural’ value (ACHnat) that might be experienced when the house is not being pressurized by artificial means. Then calculate the energy required to heat the naturally infiltrating air on a yearly basis. Then calculate the cost of the energy used. Converting ACH50 to ACHnat is based on many assumptions including the climate zone, height of the house and the degree to which the house is shielded from the wind by surrounding vegetation and other structures. Energy Star recommended a value of 17.8 for ‘well shielded’, 14.8 for ‘normal’ and 13.3 for ‘exposed’ locations in Zone 2. Let’s use the normal value for now. Dividing 1 ACH50 by 14.8 equals 0.067 ACHnat. This means approximately 6-7% of the air volume in the house (992 ft3) will be replaced by infiltration each hour. [This is not entirely accurate since the volume of the basement is included as conditioned space, yet it is not heated directly.] Let’s assume the inside temperature is 65°F and the outside temperature is 10°F. It takes 0.018 BTUs per hour to heat 1 cubic foot of air 1°F. 992 * 0.018 * 55°F = 982 BTU/hr to heat the infiltrated air. We can use heating degree days (HDD) to estimate the cost over a typical heating season. In our climate area we have 7100 HDD in a heating season. Substituting 7100 for 55 in the above calculations and multiplying times 24 to get a daily value means you would spend roughly $125 for one heating season just to heat infiltrated air. But as I mentioned earlier, an air-source heat pump can be 2 to 3 times more efficient at converting electricity to heat than simply using electrical resistance. There are other factors that also temper that number. I found the following formula in several blower door manuals (see here, section 6.3.d). The formula introduces two correction factors, one for the efficiency of the heat source and one for everything else. 26 is the result of multiplying the heat capacity of air (0.018) x 60 minutes x 24 hours. HDD is the Heating Degree Days (7100). Fuel Price is $/BTU. 1 BTU = 0.000293071 kW. Multiplying times the price of electricity in our area $0.14 kWh gives us 0.0000410299. CFM50 is 245 for 1 ACH50. N is the Energy Climate Factor (14.8). Seasonal Efficiency is the efficiency of the heat source. ASHP range in values from 1-3. Let’s use 2.5. This is one of the correction factors I described earlier. 0.6 is the second correction factor. I found a brief description of what this value represents here. Using these inputs, we will spend about $30 per heating season just to heat infiltrated air. If you set Seasonal Efficiency and 0.6 each to 1, then you get roughly the same value I described earlier, $125. $30 represents the annual cost for air infiltration and it’s less than 6% of the estimated $510 we will spend annually to heat the entire house (space heating only). We can now compare the cost of heating the infiltrated air per heating season for a number of different ACH50 and CFM50 values. In fact, these numbers should be even less because I’ve included the basement volume in these calculations. The basement is not a heated space but it tempers the temperature in the house. If we can hit a target of roughly 1 ACH50 we will pay 20% of the cost of an EnergyStar house with 5 ACH50. You can also compare the different values based on Energy Climate Factor. Another way to think about it, our cost is roughly proportional to the amount of air leaked in a blower door test, 6% leakage equals 6% cost of our projected annual heating bill. Saving 6% per year is a lot better than the interest I’m earning on my other investments, and those savings increase as the price of electricity goes up. Just remember, 6% in this example is based on the expected performance of our house (insulation values, % of window area, orientation, climate, exposure, etc.). A house with lower insulation values, and a warmer climate will find a different % of savings by building a tighter house.